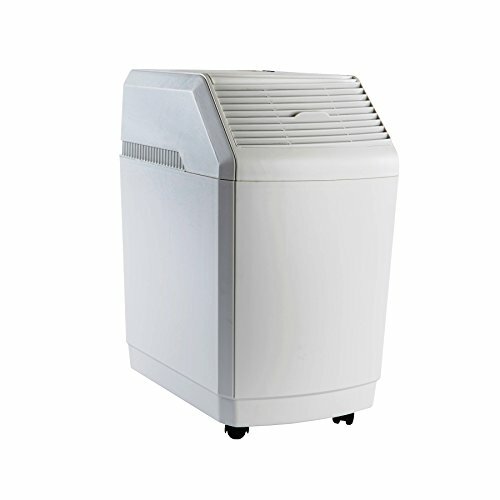 Evaporative humidifiers are a great solution for adding much needed humidity to dry air in the home. By raising indoor relative humidity levels to 43% or above, 86% of airborne virus particles are rendered powerless. Maintaining proper humidity levels also helps treat flu and allergy symptoms by soothing dryness, itchiness, and irritation in the nose, nasal passages, sinuses, mouth, throat, and eyes. Many people think pet hair is the cause of allergies, but in reality, the cause of allergens from pets is actually from their dander. Adding moisture to the air reduces pet dander and other airborne allergens. Evaporative Humidification not only produces comfortable/healthy air, it is also an extremely effective way to save money on energy cost. Adding humidity to the air allows you to remain comfortable at lower thermostat settings. "The rule of thumb is that you can save about 3% on your heating bill for every degree that you set back your thermostat," says Bill Prindle, deputy director for the non-profit American Council for an Energy-Efficient Economy. This means evaporative humidification could save you up to 20% on your energy bill. If you have any questions about this product by Essick Air, contact us by completing and submitting the form below. If you are looking for a specif part number, please include it with your message.